Husband Walter has been working on assembling our artftcial Christmas tree today and yesterday. This is its final year. It is shedding needles . . . and branches. How could that be? We just bought it in an after-Christmas sale a few years ago. A few years? Hubby informed me it was in 1995. That’s sixteen years ago. As hubby was wrestling with strings of lights, I tossed out the idea that we could just go buy a new tree. No, he had already invested energy and heavy thinking into wiring limbs in place and putting some of the lights on. Besides, paying full, before-Christmas prices for seasonal decorations and “stuff” is not in our genetic code. At least I haven’t seen any silver duct tape holding the tree together . . . yet. Now don’t start cringing if you choose to deck the halls well after Thanksgiving. I have a good reason for an early tree set up. I am hoping for a repeat of last year’s tree decorating with grandkids and their moms and dads following our after-Thanksgiving meal Friday. 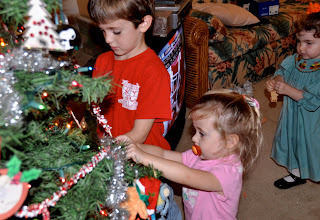 Grandchildren create the 2010 edition of our Christmas tree. For each of our sons there is a box containing ornaments that we gave them each year and ornaments they made in elementary school. 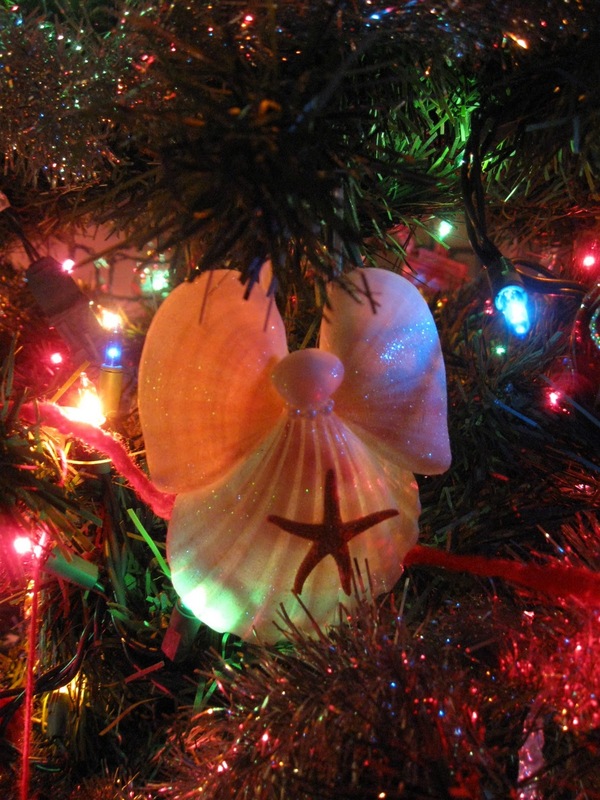 Although the Christmas keepsakes survive in various stages of wear, tear, and disrepair, the memories still sparkle. When I hold a little wooden truck ornament, for example, I can see our youngest son as a toddler, lying under the Christmas tree, rolling the truck back and forth on the floor. The ornament was still attached to a tree branch, so he was also pulling that branch down almost to the floor, too. A still beautiful bright red glittering egg-shaped ornament brings back memories of our oldest son proudly sharing exactly how he successfully blew the raw egg out a tiny hole and kept the egg shell intact for decorating. 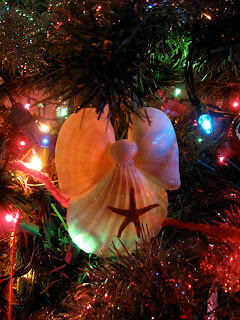 Daughters-in-law have added to our memories, too, with now treasured ornaments. And as I “undecorated” the tree last year, I discovered tiny Lego Clone Wars soldiers from the Star Wars’ series, left behind from grandsons' intergalactic battles. Last year’s decorating chaos was priceless. This year our youngest grand is an active 18 months old. We’ll see how that works! October and early November visits from grandchildren and their parents were special treats that left me wanting more. If all goes as expected we will see them again for our “day after” Thanksgiving. In the meantime I am enjoying images that son Walt captured of his four and several I snapped of son Jeremy’s pair. 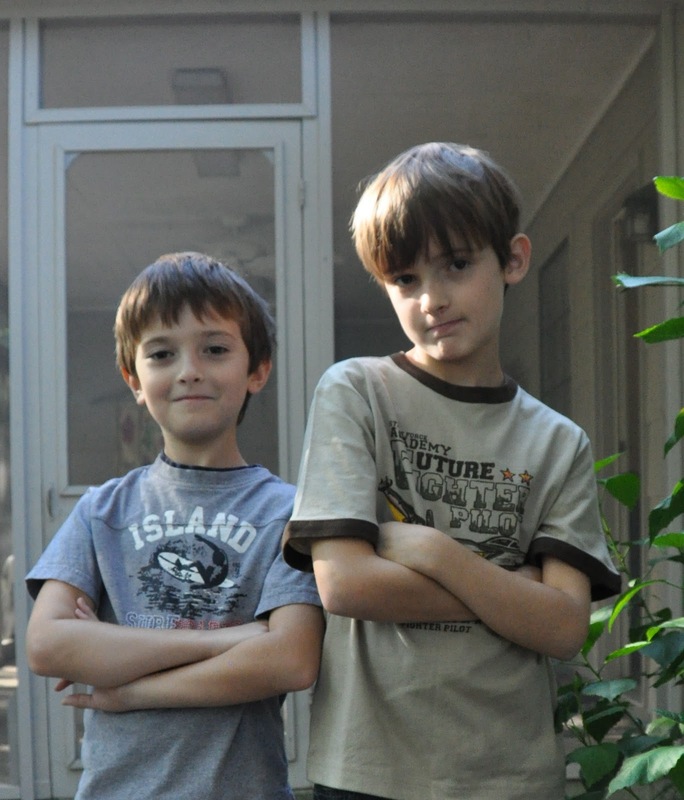 Brothers Nate, left, and Luke display an obligatory tough guy look while barely suppressing a laugh. 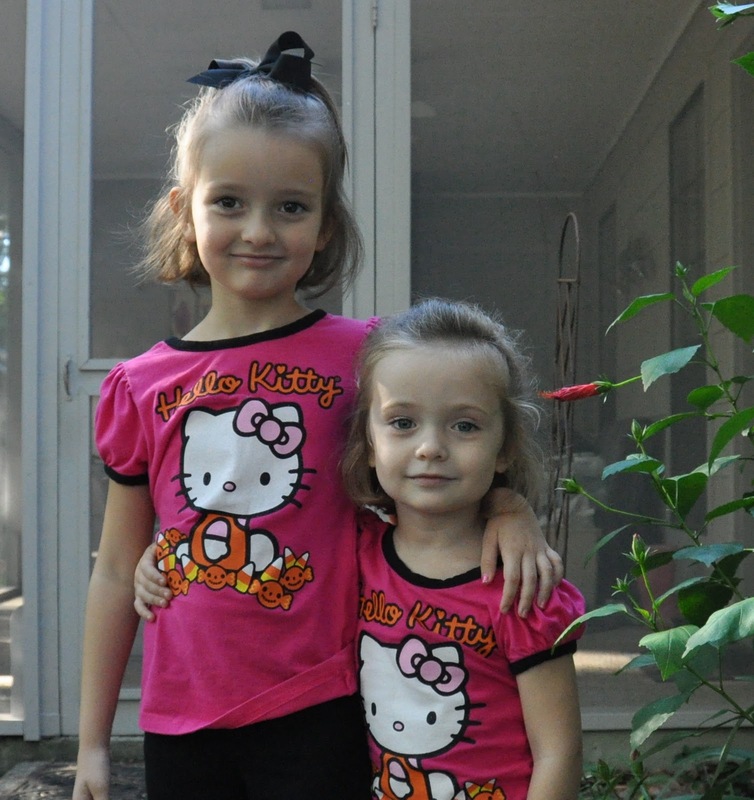 Sisters Charlie, left, and Stella model their matching Hello Kitty apparel. 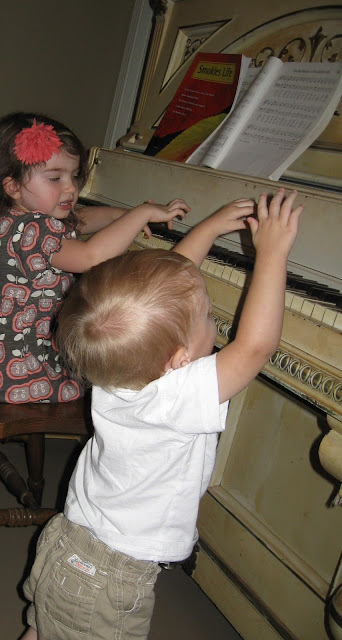 Siblings Molly Kate, left, and Walker prepare to launch into a duet on Nana’s piano. 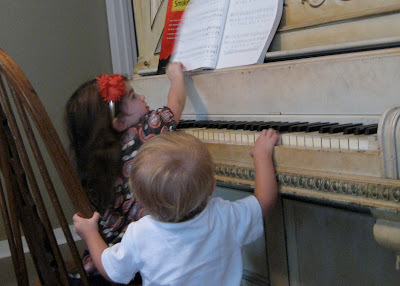 The MK-Walker duo enthusiastically demonstrates toddler keyboard technique. Here is another big “thank you” to fellow bloggers for the encouraging comments, shared memories and thoughts, and queries on how my mother and I are doing. I have been out of therapy for a number of weeks, or I guess months now, and husband Walter and I have been attempting to keep up with the at-home exercises. Now there is good news. A call from the outpatient neuro rehab center yesterday informed me my insurance has approved 10 more physical therapy sessions. My physical therapist, Ashley works mostly with improving my walking and getting torso and everything else to wake up and work together. This morning I called back about scheduling and learned that I have 24 more sessions for occupational therapy. Occupational therapist Amy works with my hand and arm mostly. That is extra good news since other than the severe sensory deficit on the left side, it is the left hand, arm and shoulder that have been the slowest to regain function. Woohoo! Another happy: With the help of my former boss and a member of the team I worked with pre-retirement, I have connected with another former colleague who is traveling to Hattiesburg for a night class at the University of Southern Mississippi only a few blocks from where my mother lives. This angel of mercy will pick me and my walker up at my home in Ocean Springs this afternoon, drop me off at my mother’s before class and pick me up for the return trip home after class. I will have the chance for a visit with my mother. I look forward to catching up with my former colleague, too. Just goes to show that in spite of all the negative news we hear, there are still a multitude of wonderful, unselfish people in this world. They give their precious time, effort and resources to help in large and small ways. My personal experience on the receiving end is that the small ways are only small in the eyes of the giver. For the receiver, each unselfish contact, whether word or deed, is a huge, generous blessing with ripples that expand outward in an enormous circle of impact. My mother’s strength continues to diminish. But she is still enjoying visitors, breakfast foods and some other dishes. She is thankful for the caregivers who come in 12-hour shifts and make it possible for her to move from bed to wheel chair and to her favorite recliner. She is on oxygen now. A portable unit allows her some freedom outside her apartment. Our youngest son visited her today and said she had lunch with him in the restaurant-styled dining hall. The caregiver on duty rolled her down in the wheelchair and stayed close to assist. And the blessings continue to shower down! For several weeks I have wanted to post about the electronic medical devices that are contributing to my stroke recovery. Specifically, I was focusing on those that use electrical stimulation to zap disabled nerves and muscles into action. In the process they encourage the reeducation of healthy brain cells to take over jobs once performed by their now stroke-fried compatriots. I am guessing that “Zip-a-Dee-Doo-Dah,” which we pronounced “zippity doo dah,” was among a repertoire of songs my mother employed to distract me during the frequent ear infections that alternated with bouts of nausea and throwing up during my first four years. Yeah, I know. That was more than you wanted to know. Details such as song lyrics and timelines from those days are often lost to me. So, of course, I googled "Zip-a-Dee-Doo-Dah." I was surprised, though, that my first Google search turned up several articles about whether the song is too racist to sing. Hunh? "Zip-a-Dee-Doo-Dah" was from the 1946 Disney film Song of the South and won the Academy Award for Best Original Song in 1947, the year I was born. From the columns I read on-line, the authors’ objections were, in part, that the movie portrayed the lives of rural African Americans of earlier times as happy and uncomplicated by racism or hardships. I don’t remember ever seeing the movie although I can retrieve the Disney image of the Br’er Rabbit character from the depths of memory. So if not planted via movie the image must have settled into my brain via books. I found on eBay quite a few Disney Little Golden Books that were copyrighted in 1946, reissued in the 70s and that featured Br’er Rabbit’s escapades. And Little Golden Books were more a part of my everyday life back then than movies. What I remember, correctly or incorrectly, is that some character bigger and faster was always after Br’er Rabbit; but he was audacious and survived by his wits. I vaguely remember admiring Br’er Rabbit, probably because I was surrounded by healthy, strapping cousins, playmates and children at church who were all my age but bigger, faster and more daring than I was. Okay that’s it. This detour has gone on for two days now. When a detour leads to avid virtual window shopping on eBay, it is time to stop. I have to say, though, that it’s been an enjoyable tour through information that is new to me and that brings new dimensions to childhood memories. Help, Denizens of the Blogosphere! I was inundated with spam a week or so ago. Even though Blogger's spam filter worked effectively, I considered going back to having that thingee with the irritating bunch of letters. You know, the one you have to type in as part of the process when posting a comment. The onslaught of spam seems to have diminished to an insignificant trickle, but is there anything I should watch for about spam dangers ahead? This is my 315th post and around about post No. 200 I realized there was a good possibility that I was repeating myself. I have spent (as in wasted) time looking back at old posts when I vaguely remember earlier episodes of pondering similar thoughts for a post. My searches aren’t particularly effective. Recently I have tried to bring a little more clarity to my post titles and labels. Is anyone else out there plagued with such blogging memory challenges and how do you handle them? Bloggers whose blogs I visit acknowledge comments in various ways. Some reply in the comment section of the same post on their own blog. One emails me. Some leave a thank you in a comment on my blog. Gracious, creative and articulate individuals have left comments on my blog, and I appreciate, enjoy and even find encouragement, healing and laughter delivered through their comments. But I don’t seem to find an easy way to reply when a reply seems called for. When I am somewhat consistently blogging, my only consistent acknowledgement of comments is to regularly visit the blogs of bloggers who comment on mine. My visiting and commenting on their posts has little to do with commitment or determination to acknowledge their comments, though. I just enjoy their posts and am already checking in to see what they are up to next. Plus, their posts always seem to spark an irresistible urge to chime in on the conversation. I do enjoy acknowledgments that come my way, but am I guilty of negligence? Is there any “rule” of blogging etiquette about acknowledging comments? And what about the length of comments? I find myself prone to leaving paragraphs instead of those concise, witty comments that I aspire to but never quite achieve. Where is the line between an appropriate and an inappropriate length? What other blogging bad habits drive you crazy or irritate you to the point you might fantasize about what could constitute appropriate cyber mayhem? Today marks the third week since my 92-year-old mother decided to discontinue dialysis. She has grown steadily weaker. Monday we started 24-hour care with caregivers who are approved for working with residents of Provisions Living where Mother has her studio apartment. On our Saturday visit she said “not yet” to caregivers. Monday the hospice nurse called and let me know it was time. I made the call, and by 2 p.m. a caregiver was on duty. I know others have gone through the end-of-life experiences of loved ones when physical disability or other circumstances prevented you from being with your loved one daily. I want to be the one there holding her hand every day. But my stroke recovery hasn’t progressed that far yet. I am working on keeping my focus on God’s care, though. And the evidence of that care helps me fight frustration. Mother loves the ladies who are taking care of her. Their ministrations have brought her physical, spiritual and emotional comfort. Same with the hospice nurse. And they have comforted me with their reports, which, while clear on her weakening condition, also include insightful details about her continued pleasure in visits, brief visits, that is; quiet discussions of Scripture passages with a caregiver; and thankfulness for the simple experiences of a warm shower, sausage gravy over a biscuit and a night’s restful sleep. I hope to be by her side again soon, holding her hand. In the meantime, I am thankful she is surrounded by other relatives and new and long-time friends who love her.